The ATE systems of the past have always been "islands of automation". They are great at carrying out complex functions and collecting data, but not as great when it comes to connecting with existing test and data systems. The complexity of setup configurations, backups, and file repositories can slow down the development process. Guru was designed to simplify the process of storing data and sharing it throughout multiple test and data systems by developing a platform agnostic networked filesystem. If Cassini is a collection of parts that function as a single unit, Guru is the nervous system that connects it all together. The platform works in concert with the Cassini's software and runs quietly in the background. An easy-to-use interface for managing software updates. A tool for organizing test configurations, resources, and data for easy retrieval. An automated repository to simplify design iteration and setup recovery. Every file is digitally signed by the Guru which created the original file. The signatures are checked by any Guru which receives the object and if the signer is unknown to the receiver, the document is not trusted. Files may also be encrypted by Guru so that only a Guru with the matching key can decrypt and use the file. The encryption and decryption is done automatically so the end user is not burdened with the process. Cassini draws upon a variety of resources to execute a test: handle configurations, test patterns, calibration data, fixture definitions, etc. Guru acts as an organizational tool to keep these resources linked to their respective test plans. As files are created and modified, they appear chronologically in a revision history that mirrors the test iteration process. Access update streams for all licensed seats of ATE, Virtual Workstation, and Guru Server. Includes advancements in testplan buttons, calibration and error adapter techniques, data viewers & worksheets, calibration, verification, and diagnostic testplans, user interface tools, and editing tools. With a valid Software Subscription support plan, packages are released electronically as needed or by request. Send us feedback on features and customization requests. Full Production functionality is maintained during a network outage so no testdata is lost. Test Developers can use Virtual Workstaion to make changes to testplans and verify when precious test time is available, improving system utilization throughout the DUTs product lifesycle. Guru loads the correct calibration data based on the DIB, Fixture or Instrument's serial number. 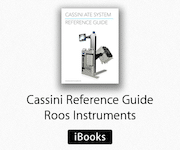 We maintain a Guru server at Roos Instruments which distributes factory calibration data to our customers. It also gives customers a way of sending back a "simulation" that helps us diagnose and fix software issues which may occur in the field. All testdata is stored locally for maximum reliability and backed up to the Guru Server where it is processed by a scheduled Agent that relays the STDF datalog for data analysis and long term storage. Central processing reduces the demand on the ATE controllerand enables administrators to configure data processing once. Each Cassini system and Virtual Workstation has a local Guru that backs up every configuration, resource, and test result to the Guru server. This process prevents data loss from a controller failure which is one of the most costly and disruptive events that can be encountered on a test floor. Installing a replacement Cassini controller is as easy as swapping the EPC TIM and plugging in the network cable. Files are restored on-demand, the entire process is quick and easy and the operator does not need to worry about data loss or a lengthy setup of the replaced controller. A tester fulfills two distinct roles in its life on the production floor: test development and production testing. During the development phase, the tester is used to explore different configurations with the aim of creating the most efficient test cycle for the production floor. In the production phase, configuration is locked, and the fastest, most reliable test is run the same way repeatedly for a high test volume. Guru provides a great degree of control during both phases for simplicity and reliability throughout the entire process. Development: Experiment with new software enhancements without disrupting production. Log incremental changes in tester configuration. Simulate and validate test plans before release. Production: Lock test plans and configurations. Restrict permissions to key files and configurations. Simplify user interface to display only the controls essential to test execution. Guru is used to store files such as Test Plans and Test Executives, data files, calibration information, and even system software and updates. Files in Guru are like those in a database which can be accessed by file name, like a typical file system, but they can also be found using "metadata", or keys and values assigned to the file. For example, a test executive has key values such as "in development" and "released to production" to easily find the execs which should or should not be seen by operators on the production line. Guru also uses metadata for easy grouping and retrieval. This allows the user to locate the files and load them as a set and control which sets should be accessible to operators on the production floor. Unlike a normal filesystem, Guru is a specialized database networked in a hierarchical way. If a file is requested from a Guru and it does not have a match, the Guru requests the file from the Guru server. In this way, Test Plans can easily be shared among testers, where each tester connected to it will find the Test Plan when it is needed by the operator. The connection is firewall-safe since the local Guru always initiates the communications with the server Guru. For critical workloads, Guru Enterprise server acts like a cluster by cloning itself so that all data on the server is instantly copied to its clone. If a Guru Server is not available, system controllers will automatically connect to the next available Guru Server in the cluster. If the Guru Server fails, it can be recovered easily from the clone with a few simple commands, reducing downtime to zero. Virtual Workstations allow developers to continue working on testplans on any Windows, Apple Mac, or Linux machine without needing to use valuable time on the test system. Guru Server can be deployed in a private cloud virtual environment for easy deployment and management. When data security is an ultimate concern, 128-bit Blowfish encryption can be used to encrypt the object payload and selective metadata tags allowing robust sharing accross the public web. Policy based access control enforces end-to-end encryption supporting a robust security implementation by using a one to one permission based access control. Guru is able to launch scripts on timed events, such as when Guru is itself started or every hour while Guru is running. A Guru Agent copies files from the Guru to a local filesystem or a FTP server. Files can be selected using keys and values, for example, to send any new datalogs to a special FTP account for processing by your own analytics suite.